Take the controls and experience the rush of flying a high-performance military jet trainer. You’ll fly with an experienced flight instructor. The final decision over who can fly and train in the L-39 is made by one of our FAA certified L-39 pilots, in accordance with FAA regulations. As a general rule, you must have a pilot’s license, verifiable flying experience, be in reasonably good health, meet basic height, weight and TSA restrictions, and sign a Release of Liability. Contact Incredible Adventures for more info. What if I don’t have a pilot’s license? Can I still fly a fighter jet? Call us! We offer a variety of flights for non-pilots. When can I fly an L-39? Flight training is offered all year long, by appointment. Choose to complete a single lesson or all the training necessary to fly solo in an incredible L-39 jet fighter. Training is offered year round in Florida at select airports. Who will be my pilot? 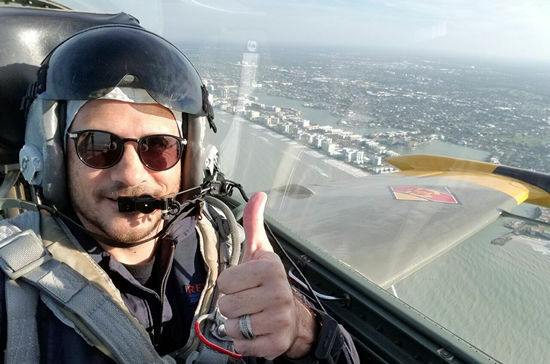 You’ll fly with an experienced pilot, approved by the FAA to fly the L-39 and conduct flight training. The cost depends on the training selected and your prior flight experience, but typically ranges from $3000 to $20,000 US. Can I bring someone with me to the airport to watch me train and fly? Most likely, yes. For safety and security reasons, guests must be approved in advance and should be aware they may not be granted access to all areas of our training facility. Absolutely! (So is crossing the street and driving to the airport.) You will be required to sign a release of liability. We use the best planes and the best pilots and your safety is our biggest concern, but you must assume all risks. The L-39 is considered an “experimental aircraft” by the FAA. How can I schedule my flight training adventure? Call us today.1-800-644-7382 or 1-941-346-2603. Note: Incredible Adventures does not own or operate aircraft or employ any pilots. Incredible Adventures / IA Worldwide, Inc. is a marketing company enlisted by pilots to promote their flight services. All flying, training and aircraft maintenance decisions made by the pilot in command and/or aircraft owner. WHAT ELSE CAN I DO IN FLORIDA?